Gertie's New Blog for Better Sewing: The Finished Coat! It's done! The much labored-over coat. I find there's really not a whole lot to say. After all, I said A LOT during the process - ten videos worth! I love the coat. I really do. I'm so proud of my construction on this project. I do still wonder if I got the fit exactly right. And in retrospect, I really should have converted the one-piece sleeve to a two-piece tailored sleeve to avoid the bagginess I've got going on. But you know what? I'm not going to nitpick. It's a beautiful coat, it's warm, and I made it all my own little self. Now please allow me to indulge in way too many photos. Hooray for me! And hooray for you - for all your tips and encouragement along the way. I've had a handful of you write to me and say you've been inspired to start your own coat. And that makes me very, very happy. Gertie, that coat is absolutely stunning and you look absolutely fabulous in it. Congratulations! What a beautiful coat! You look gorgeous and I adore the spotty lining - very bespoke! The coat is wonderful! No nit-picking allowed! We seamstresses do that far too much anyways... Be proud of your achievement and love the coat! Wowsers, it really is very very cool. Fabulous colour on you too. 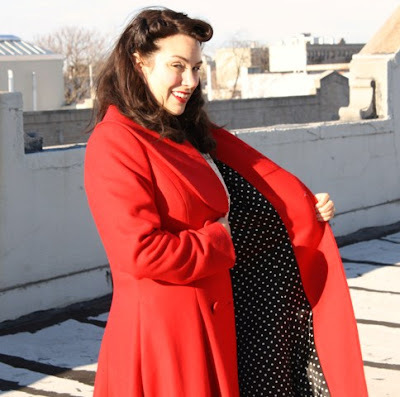 Plus - your new energy for doing your vintage hair really pays off when you slip into a little beauty like The Coat. Oh, this coat is absolutely adorable. I love the swinging skirt, the polka dot lining and the color is gorgeous! Stunning! Simply beautiful, and the gorgeous detailing takes it to a whole new level. The fabric looks luscious, the lining is fabulous and the swing... let's just say, it's the kind of coat that would make me skip every time I wore it, just for the pleasure of feeling it swish. About it being more fitted, I think it looks great as is - it's a winter coat, and you want to have the option of wearing thicker clothes underneath (which may come in use, as they're currently predicting this wave of glacial winters to last another 20 - 30 years...). Whatever the case, you deserve to be proud, you've done a most amazing job! It is gorgeous - it fits beautifully and swings so nicely. A job well done! Fabulous!! It is absolutely gorgeous and looks amazing on you. Very nice work! Just fabulous! It looks great on you! I'm usually more tailored, but now I want a full skirt coat! That's beautiful and red is definitely your color! beautiful coat! I love the action shots. It looks fantastic! The perfect coat!! You should be so proud!!!!!! It's gorgeous! It's handmade, tailored, it's bright red, and it goes 'swooosh!' What more could a girl want?! Hi Gertie, Very Glamorous! I want a red coat too! Please can you show the close-up of the buttonholes? I'm curious how they came out since you were sending the coat away to get them done. Beautiful! And you can see all of the hardwork you did in the finished garment. It is just so beautiful - all the amazing work definitely paid off. You look great! Thanks for sharing the journey with us! It was a lot of work but it seems to be worth it ! This coat is even more beautiful than I thought. You did a really good job and I hope you are proud of you and your coat. Beautiful! Fantastic job and inspiration. FABULOUS! Love the color, the lining, and it fits you to a "T"! Love it! OK, hands up who *doesn't* want a red cashmere coat with a silk polka-dot lining fitted to your exact measurements? Gorgeous, and warm, and just great. You should be proud of yourself. Aieeeeee, the shots where it's spinning out and you can see the lining--gorgeous! You're going to have to swirl down the street now, though, so watch your step. I see what you mean about the *slight* bagginess in the arms as this is something I deal with in my (purchased) coats...but as others mentioned, one does need room to layer and MOVE in coats. I tend to want them to fit like a sweater, and while this gives a lovely line, raising one's arms while in a coat is rather a plus, ha. Congrats on finishing up; enjoy the proverbial fruits of your labor. Gorgeous coat, and it's so you :) Enjoy wearing it! That coat is a thing of beauty. Well done, you! You look amazing in your coat. The coat is fabulous. I love how you are having fun in your shots. Perfect. Gorgeous. The fit is immaculate and the color could not be more lovely on you. And the lining, be still my heart. WOW!! That was a coat worth waiting for. I love it, that colour is my all time favourite and it looks perfect on you. I also love those action shots. I bet you never buy another now you've seen what you can do...! WOW! The coat is stunning! Huzzah! Congrats on a job well done! And thanks for sharing the journey along the way. You've inspired me to start thinking about making my own coat and I know I will be referencing all your vlogs along the way! Gertie it is beautiful!!! You did an amazing job. Congrats!!! Such a splendid coat! As others have mentioned, a bit of room in the sleeve will keep you warmer. (And it's not as if they're noticeably baggy; the coat looks sleek!) I've been following along since you made the muslin. Thank you so much for sharing your work! I'm impressed by your tremendous skill and intellectual generosity. Thanks again!! It's a fabulous coat and suits you really well. I love it! That is like the perfect coat! You've done an amazing job on it! Wow, Gertie, that coat looks stunning on you. All your hard work really paid off. It is absolutely gorgeous. This is beautiful, beautiful! I've also made coats from Vogue patterns with the same bagginess in the sleeves... comes in handy when you wear something heavy underneath, actually! Enjoy your coat. It looks like so much fun to wear. Hooray! I was so happy to see your completed coat this morning! Having a warm winter coat that makes you feel beautiful is priceless. Nicely done! Beautiful coat! I love that red on you. Just in time for all this cold! Your coat is gorgeous! It looks so much better than ready to wear. Great job. This is truly a beautiful coat, and following your adventure with it was really interesting. at the beginning I thought you were a bit crazy to work on such a long and complicated project, but wow, the result is fabulous! And now there is not only this amazing coat, but what you've learned on your way. The coat is amazing and worth every stitch you put in it. Be prepared to be stopped in the street and be told how fabulous you look! Ahhh!!! It's gorgeous!! I love the skirt of the coat, too. You have definitely inspired me to make my own coat this year! Your new coat is fabulous! The fit is amazing...someday I'll have those kinda sewing skills! I'm working on it! Really, really beautiful. I've stayed tuned all the way and it was so worth it! You will be asked constantly where you got it! You keep getting cuter, you know that? And that coat totally rocks. :-) I am definitely going to sew one this year, no more excuses! I just want to chime in with everyone else to say what a beautiful coat you have made and how nice it looks on you. Well done! Excellent job! You are my hero. Just for fun what you need now is a matching muff with the black polka dot lining and a red crochet chain around your neck to hold it. Oh I love that! So cute with the polka dot lining! Beautiful! Such a fun coat and I love the color. Fabulous. The colour is so gorgeous and the lining is the perfect contrast. It suits you so well - you look amazing in it. Such a beautifully constructed coat will last you for many years. It looks awesome! I love the polka dot lining! Your coat turned out gorgeous and the red is beautiful on you! Absolutely stunning. I wonder how many women will accost you with "Where did you get that?" Gorgeous...I love these photos - your delight is contagious! And, oh, the swinginess... Congratulations! Love it, love the lining, and love that last sassy picture! There is nothing I can say that hasn't already been said. The coat is stunning, beautiful, magnificent! I LOVE it. Excellent job. I wish I had your dedication! WOW!!!!!!!! !Te quedo PERFECTO!!!!!!!!! FELICIDADES!!!!! It is PERFECT!!°! CONGRATSSSSSSSS!!! Wonderful work! I am so jealous, but I very much appreciate the work that went into the fabulous result. Oooh la la, each and every photo! Anyway, the lining is adorable and it looks wonderful on you!! Keep up the amazing sewing you are doing!! You are an inspiration!! It looks just beautiful. And it took so much patience and skill to make. Congratulations on your gorgeous coat! What fun to have something so splendid (and warm) to wear that you made yourself. Please keep us posted on how many women ask where you got it! It was worth the wait! It's absolutely gorgeous! Thanks for the inspiration along the way too. You make me believe it's possible to tackle my own coat for next year. Great work, Gertie - you look stunning in your new coat! You should be so proud. It is beautiful. If you plan on wearing your new coat to work I hope you have an extra special hanger to put it on. No hooks for that specail coat. Wow! Yes, no nit-picking! You only notice the problems because you've made it yourself. If you bought it, you wouldn't even realise! You look stunning. It suits you so well! I love the twirliness! I don't think the sleeves look baggy at all - like Lilly above said, you probably would not think it were so if you had purchased it. I bet you get so many compliments in it - the shape and color are so standout. Congratulations on completing it (and being done!). What a fabulous coat. You deserve every single compliment you've received. Congratulations. I love the polka dot lining, and the color is perfect for you. Woohoo! Looks fantastic! Thanks for sharing your journey and tips in the vlogs. Well done! Gorgeous! Love the lining! Gertie! It's absolutely beautiful! I love the way the skirt swings when you swirl! Your concerns about the tailoring reminded me of my most recent (and only) coat making experience. Last month I finished a coat, and when I modeled it for my boyfriend he said, "It looks really nice. It just looks like it needs to be tailored a little." Can you imagine? I spent hours making the plaid match, putting each piece together perfectly, painstakingly sewing, and in the end, was told it looked great, but just needed to be tailored! Not the review that I wanted! You should be proud - there's something very exhilarating about completing a complicated pattern, especially for the first time!! You look so gorgeous in your coat! That bright red colour suits you so much and is to die for. I love it! Makes me want one soooooo much ... though it is so hot here in Australia I'm not sure I'd ever get to wear it! Wow Gertie 89 comments. I'm jealous. but they are so deserved. Your coat is absolutely stunning and red is sooo your colour. I have to say that I found your blog at the right time. I've never made a coat before and certainly not one for a Man. Your vlog/blog and my Tailoring book is very helpful. I totally shutdown after cutting the pattern last Nov and decided to finish it. Low and behold while looking online help for inserting lining, you popped up. You've made an amazing coat and I'm on Vlog three now. WOWZA!!!! I have to tell you, i nearly jumped up and down when I saw these pictures! hehe. Bravo on finishing this project! The fabric just hangs beautifully--even from the photos I can tell how much work and care was put into this. Really, really stunning, Gertie! It was so exciting to follow your process and learn some handy (well, someday ;) tips and tricks for making a proper coat. Fantastic Gertie, just as I knew it would be! Your coat turned out so beautifully! I'm really jealous. Your vlogs made it seem approachable though, so mabe I'll muster up the guts to do one too! Can't wait for the next vlogs! wow, so amazingly beautiful! great job!! I would love to have a coat that beautiful! Oh, that is FAN FREAKING TASTIC. Lovely work! Just PERFECT! I love the matador poses too-- it moves so well, and I'm sure feels just amazing!! Thanks again for all the posts along the way; I learned so much! Your coat is beautiful!!!! I just love the lining! I've been away and am only now catching up; you've finished! It looks amazing and I'm totally inspired to start one myself this year. Your coat is really, really beautiful! I love the color and the pattern, and the lining is sooo awesome! I'm still a beginning seamstress, so I'll stick to skirts and dresses for now, but I have thought about sewing a coat and with your vlog, I can totally see myself trying it sometime in the not-too-distant future. I'm in love with this coat!!!!!!! It's the perfect color and gorgeous. Right now I'm working with pleating and layering. It's my first task with extreme detail. I can only hope it looks as put together as this coat.